The Maison L'Orchidée Is a Chambres d'hôtes. Bed & Breakfast. With Five bedroom Suites and four bathrooms. It is an Original master vigneron house built in the 1700's with original stone features, tilled and wooden floors, high ceilings and doors. All bedroom suites are themed decorated. The Asia, Africa and Ancient suites are Ideal for Couples. The Rustique Suite can accommodate up six people, so is ideal for families. It also has a large bathroom with a Jacuzzi bath. All rooms are ensuite with tea and coffee facilities, towels, hairdryer and Sat TV DVD the house is in the heart of the beautiful village of Saint Hilaire within the shadow of the Abbaye Saint Hilaire, where the first Blanquette sparkling wine was produced, long before champagne was invented. The terrace at the front is ideal to sit outside and drink your coffee/wine or take your breakfast. While watching the slow pace of village life passes you by. 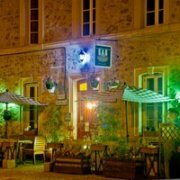 Evenings meals are available please check details on web site ..
Mediaeval city of Carcassonne just a few miles and a short drive away. The countryside of vineyards is forever changing with the seasons and never loses its beauty. Check out the property website. 66€ euros per night, Three Ensuite rooms two persons including the breakfast, Rustic suite 2bed suite for Upto 6 persons connecting rooms with Spa bathroom 126€ euros per night for four persons , Extra person 26€ euros per night three nights or more discount Full booking deatils see website .Evening Meals are available .